In the desert southwest, landscaping-with-rocks instead of huge lawns, is common. That may sound crazy, but with the desert as a backdrop, the house below uses all the elements and rocks with natural colors of the area to create a stunning arrangement. Simple drip irrigation lines are run under the decorative gravel and landscape fabric for the plants. 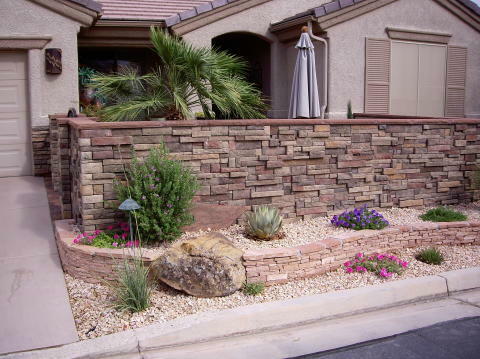 Flat rocks are placed together in this rock landscape design to form a dry stack retention wall , elevating the plants behind for variety in an otherwise flat yard, and providing a backdrop for the flowers in front of the wall. Boulders are placed strategically in the gravel and plants native to the area are planted around those boulders. The color choice for the home completes the picture. 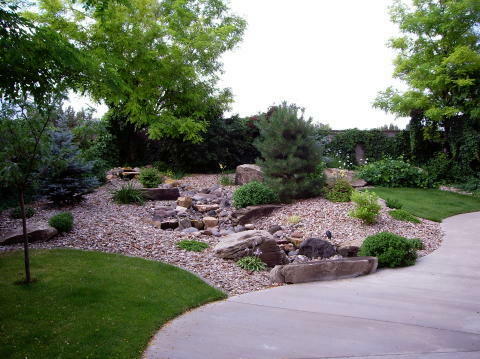 Landscaping-with-rocks will add authenticity to a natural look. Using different colors creates contrast. and using different sizes of aggregate gives dimension. Here we took a slope of lawn , added mounds and created a natural looking pondless creek waterfall just like the real thing. Above a thick slab of rock is used as a bridge over the water feature and also a step in the path. In this landscape the waterfall/creek starts at the front yard and flows around the corner and down to the back patio. This water feature is really just like a creek. We created a pave stone path to the back yard patios from the front yard walkway. This path crosses the creek four times, with each crossing a different type of bridge is used. The steps in the path make it easy to wander the yard and explore. There is even a garden grow box connected to the pave stone patio walkway (upper right of picture). This photo shows how rock were added to create an eye catching display. landscaping with boulders adds another texture and contrast color to the surroundings. It helps when the boulders are embedded in the mound or slope to make the appearance seem more natural. koi pond and gravel up on the flat levels around the pond. The entire back yard is filled with the pond and rocks with a few plants laced around the bank. The stone statues are consistent with the overall rock theme. Some people like to collect interesting rocks of large sizes and place them in a rock garden. They plant ground covers and small flowering plants in and around the rocks and place decorative statues amongst them too. When done right and maintained well, they are a stunning sight.